Howdy! and welcome to my little piece of blog-land. I enjoy making paper crafts. Very much enjoy it. I love the whole process of creating and altering. I also find encouragement from the positive feedback I get from folks who have seen my creations, and from those who have purchased my creations. I have an Etsy shop, here. 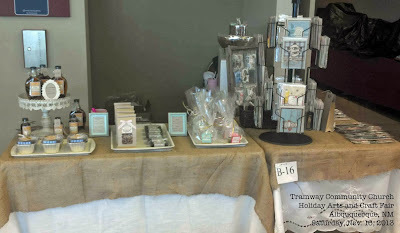 But, I also sell my creations at holiday Arts and Craft Shows in Albuquerque, NM. This past weekend, I was at the Tramway Community Church, selling at their annual holiday Arts and Craft Fair. I really do enjoy their show. The folks there are just so nice, helpful, and polite. The other crafters there are just as personable. Well, I didn't go home with empty boxes, but, I did get quite a few of my crafts into shoppers hands. My home-made food table: (left to right) on the cake stand, I have my home-made Vanilla. In front of that, I have my home-made Pumpkin-Cranberry Bread. The middle cream-painted tray, I have my Cinnamon-Spice Nuts, and Double-Chocolate Brownies. The third cream-painted tray on the right, has my Vanilla, and Chocolate Cupcakes. 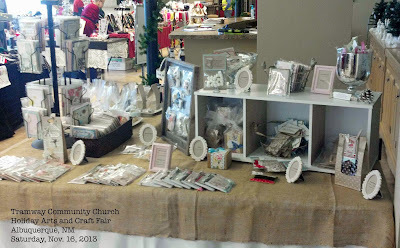 My craft table: left to right, back row - I have my hand-made cards in the card carousel, and in the wicker basket, right next to the carousel. I gave a price break (discount) if you purchased 6, and then another one if you purchased 10. I had my magnetic letters on a framed metal sheet. On top of the white shelf: I had my snowman poop, Santa's magic key, and some magic Reindeer food. In the white shelf: decorated Gift Boxes, Gift Card holders, and Food-Safe gift bags. Left to right, front row - decorated gift bags, covered notepads, and altered mini notebooks. So today I will be unloading the car, and taking photos of everything I haven't sold, and get those uploaded into my Etsy shop, here. At this moment, I haven't heard back, if I have a space @ Eisenhower School, for their Arts and Craft Show, Dec. 14th. If I don't have a booth there, I am planning on having an Open House Dec. 7th, at my daughter's house. I will keep you all posted.